All of our boats come with the necessities you'd expect from a comfortable Boating Vacation. With a fully equipped kitchen to cook and dine onboard and prepared cabins with pillows and towels, just think of your boat as a floating villa! One of the best things about a self drive vacation is that you can create your own schedule! As Captain and crew you decide how far you travel in a day and just plan to be at the base to hand over your vessel at the correct date and time. Cruise for as long as you like every day, explore at your leisure. You are at the helm! 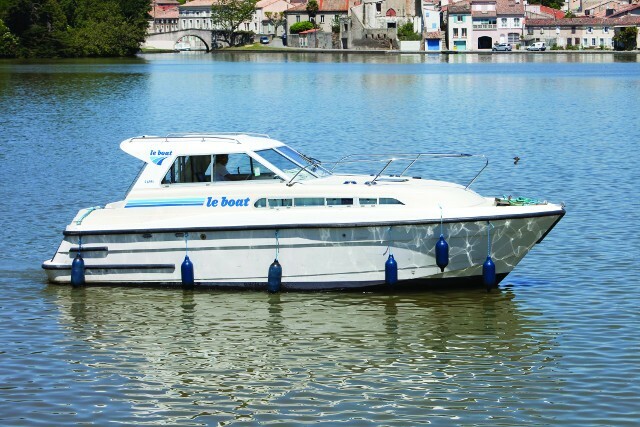 Ideal for couples with a single child, a Capri TS boat rent features a nicely appointed private cabin forward with a double bed and a closet. The bathroom is easily accessed via the saloon, which has a spacious dining area across from the L-shaped kitchen equipped with an electric fridge and fitted with ample counter space. *Availabilities of boat's type depends on base & could be found under cruise details & on booking process. *Not available at the bases of Jabel, Cherstey & Lutzelbourg. Discover the pleasure of boating step by step with a cruising assistant. Available as long as you want, he will help you during the first maneuvers, or more if you want. Day Service - $210 per day, subject to availability. *Notes : Only available in France - If the cruising assistant is booked more than one day, customer must let him a cabin on the boat and should provide food and non-alcoholic beverages. Have us look after your car while you're away. *Availabilities of parking's type depends on base & could be found under cruise details & on booking process. No parking available at Lutzelbourg. Take the whole family with you! Our boats can carry up to 2 pets. Enjoy the added comfort of deck cushions! Help us preserve the waterways for future enjoyment by buying our Eco-pack of cleaning products and toileteries. We can organize the transfer of your vehicle while you are cruising. (Please note that we cannot transfer rental cars, trucks or camper vehicles. Please verify that this kind of transfer is covered by your insurance. Order a gift basket filled with local delicacies and regional specialties--the perfect gift for a birthday or anniversary! Wifi service in select locations (access for up to 5 devices per boat). Enjoy our new stand up paddle boards! Perfect for the calm waters of canals. Enjoy great fishing party !